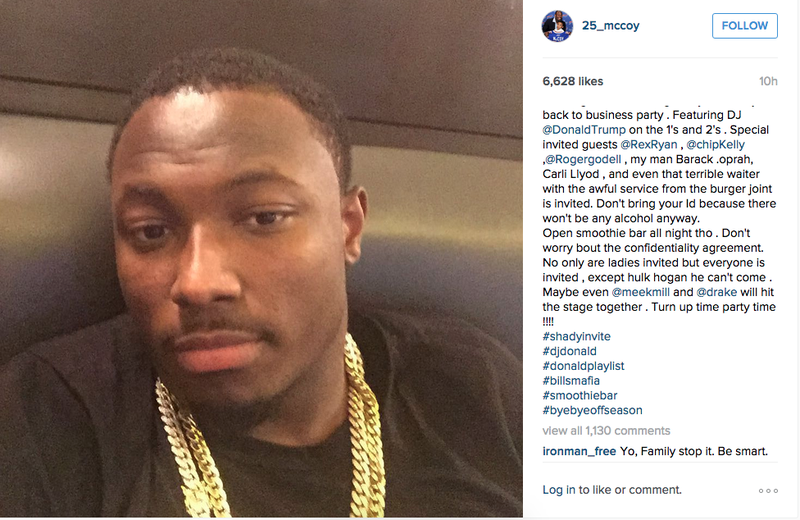 Bills RB LeSean McCoy’s “females only” party was scheduled for last night. That was before everyone had a good laugh at it, and the Bills chided McCoy for using his logo. So around the time the party had been set to start, McCoy sent out the above note on Instagram. Since the media and Internet took my before camp party outta context , I had to switch up my party strategy. So tonight I’ll be inviting everyone to my back to business party . Featuring DJ @DonaldTrump on the 1’s and 2’s . Special invited guests @RexRyan, @chipKelly, @Rogergodell , my man Barack .oprah, Carli Llyod, and even that terrible waiter with the awful service from the burger joint is invited. Don’t bring your Id because there won’t be any alcohol anyway. Open smoothie bar all night tho. Don’t worry bout the confidentiality agreement. No only are ladies invited but everyone is invited , except hulk hogan he can’t come . Maybe even @meekmill and @drake will hit the stage together . Turn up time party time !!!! Damn, that’s a good note, referencing everything from McCoy’s feud with Chip Kelly to the controversy over him leaving a 20-cent tip. It’s unclear whether McCoy’s party went down at all last night. If you know anything, get at us.